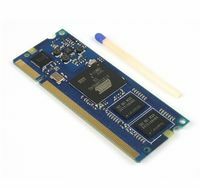 The devices ICnova SAM9G45 SODIMM and ICnova SAM9G45 OEM are all equipped with an Atmel AT91SAM9G45 MCU or its sister MCU Atmel AT91SAM9M10. The Modules operate with an ARM926EJS core at 400MHz CPU clock. All Modules provided by In-Circuit usually have a Buildroot based system preinstalled, so they can be used out of the box. For some configuration a suitable Android-Image is provided, too. Pages in category "ICnova SAM9G45"
This page was last modified on 8 February 2017, at 12:25. This page has been accessed 12,918 times.